Below is our new Peanut and Tree Nut Policy at Northlea. 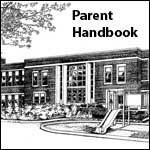 This past school year a committee of parents and staff reviewed our policy and made some changes for this upcoming school year. 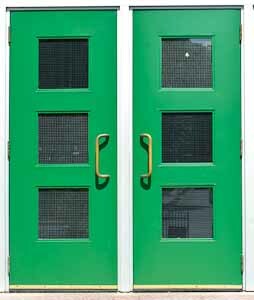 Parents needing to discuss possible additional accommodations for their child should speak to the administration. The administration may need to adjust certain aspects of this policy to meet the needs of individual students at Northlea. The TDSB does its best to ensure the school/learning minimizes the exposure of identified causative allergens/agents as part of a prevention plan whenever possible. Despite efforts to reduce the risk of exposure to zero, the Board cannot ensure an allergen/agent-free school/learning environment. The TDSB has no legal responsibility in any jurisdiction to reduce the risk of exposure to zero. Northlea has a number of students in our school with potentially fatal nut allergies. As a result, we are a peanut/tree nut “SAFE” school. This means that products containing any tree nuts or peanut ingredients are not allowed in the building or on the property. Parents are asked to ensure they review this policy with their child and ensure all food, lunches and snacks brought from home do not contain these products. As well, washing of hands prior to coming to school is much appreciated and recommended. Lunches and snacks are not to be shared at school under any circumstances. Northlea has events throughout the school year that involve shared foods that are provided by the Northlea community. When bringing food from home for these events, which is not commercially purchased (ex; home baked goods), the food items are required to be accompanied with a detailed list of ingredients (flour). This is to ensure that the all food entering the school, that is expected to be shared, is free from peanuts and tree nuts. If these items do not have an ingredient list attached they will not be served. Fruits and vegetables are permitted and recommended to be part of any event provided they are washed thoroughly. Ingredients purchased from places like the Bulk Barn include trace amounts of nut products and MUST NOT be used in any food items brought into the school. Please always remember to read labels to ensure that there is no “may contain peanuts/tree nuts” warning. The committee identified different scenarios where food is being prepared and/or consumed at Northlea. All food and related food preparation products (ex. flour) and other items that are part of the curriculum (ex. kindergarten play dough or letter day materials) must be made at school by staff/parents using ingredients from an approved supplier. The approval of such a supplier is done by the school administration only. Food bought for celebrations (ex. 100’s day) must come from a supplier that is also approved by the school administration. 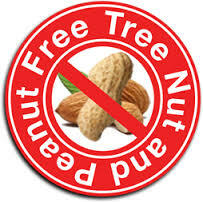 The school will work with staff and parents to generate a list of peanut/tree nut free suppliers. This policy applies to all grades to maintain consistency across the division. In most cases food preparation or consumption will not be a component of the field trip. Trips where students may be required to bring a lunch follow the same protocol as our in school policy. Any field trip that potentially does have food as a component needs will be discussed with the administration prior to being booked. The administration will determine next steps and determine the viability. Students are not permitted to purchase food on field trips. In some cases (ex. ski day) exceptions will be made subject to the approval of the administration. For any special events (ex. parties, holiday celebrations, etc) taking place in class the teacher or designate will request AT LEAST one packaged, certified peanut/tree nut free product. All home baked goods coming into the class must include a list of ingredients. . If these items do not have a list attached they will not be served in class. Fruits and vegetables are permitted and recommended to be part of any celebration provided they are washed thoroughly. This policy is applicable K-6 students. All bake sales in school will include a separate certified peanut/tree nut free table with purchased and pre-packaged items that are made in a certified nut safe facility. All home baked goods coming into the school must include a written list of ingredients. If these items do not have a list attached they will not be permitted to be sold or served. Food for Family Fun Night and the Welcome Back BBQ, must not contain any ingredients with peanuts/tree nuts. All food that is packaged must have an ingredients list that is available for families to read and check if needed. Any baked products for these events will include a separate certified tree nut/peanut free table with purchased and pre-packaged items that are made in a certified nut safe facility. All home baked goods coming into the school must include a written list of ingredients. If these items do not have a list attached they will not be permitted to be sold or served. Events outside of the school that involve food being served to Northlea students, parents or families will ensure that in the ingredients there are no peanuts/tree nuts. However, the facility or venue may potentially have nut products in their kitchen and families will need to determine the potential impact on their child in attending such an event. There also may be times when food is purchased (ex. peanuts at the baseball game) that contain nut products and as a result we can’t guarantee a nut free environment. If your child has an anaphylactic allergy they are required to follow the policy below. Upon registering your child please inform the office staff of their anaphylactic allergy. The principal will convene a meeting with parents and/or guardians to discuss the issue and the risk for anaphylaxis reaction. They will gather medical information related to the condition including: identified allergen(s), severity of allergy and past incidents of anaphylactic reactions. This will help the school get a profile of the impact of this on the student. The student with anaphylaxis may be present at that meeting. The principal will also follow up with appropriate school staff. The family is required to update the principal on changes to their child’s medical condition and they will pass this onto school staff. If YOUR child has an anaphylactic allergy they are required to have two EpiPens at school: one for the Office and one for the classroom. 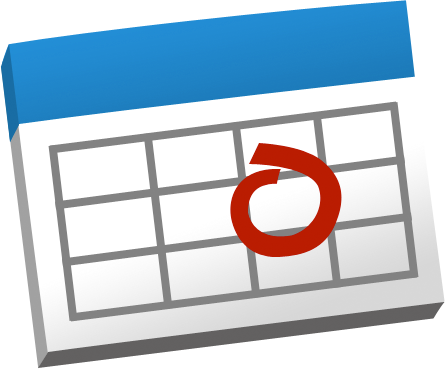 Related medical forms regarding this allergy must be filled in annually. These forms include 536A, Administration of Prescribed Medication, Form 536B, Management of Emergency Medical Concerns and Form 536C, Student Medical Alert. 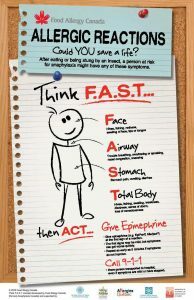 Anaphylaxis (pronounced anna-fill-axis) is a serious allergic reaction that is rapid in onset and may cause death. Peanuts, tree nuts, sesame, soy, seafood, wheat, eggs, milk, mustard and sulphites are the food allergens most commonly associated with severe allergic reactions in Canada. For more information on this allergy please visit: http://foodallergycanada.ca/. We thank you in advance for your co-operation by ensuring all children at Northlea are safe.